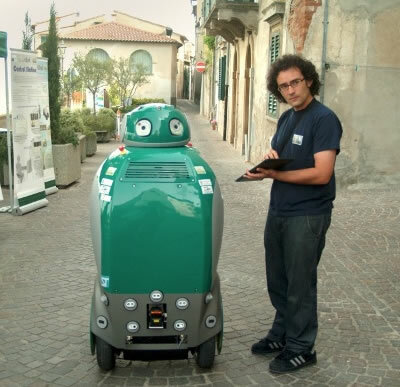 DustCart is a shiny robotic trash can has been created by a group of Italian researchers. Developed as part of the DustBot project, a $3.9 million research program that is trying to improve urban hygiene. It's only a prototype, and cannot yet navigate crowded streets (it can evade fixed obstacles). SF fans have been prepared for this future for generations. In his excellent 1959 short story Robot Justice, Harry Harrison wrote about a far more evolved robotic trash can able to detect such unhygienic behavior as spitting on the sidewalk.. Even as the saliva hit the spotless sidewalk, a waste can twenty feet away stirred into life. It rotated on hidden wheels and soundlessly rolled towards him. A flexible arm licked out and quickly swabbed the sidewalk clean. Then the can squatted like a mechanical Buddha while a speaker rasped to life in its metal insides. A tinny mechanical voice addressed Carl.